Amatrol’s 890-FTS-1 Motor Control Troubleshooting Module adds to the model 85-MT5 Motor Control Learning System to provide troubleshooting training via computer-based fault insertion. The 890-FTS-1 is unique because it can insert faults into electrical lines that carry full power to electric motors as well as control-level signals. This gives it the ability to create a more realistic troubleshooting environment for students. The Motor Control Troubleshooting Module also avoids damage to the equipment that is normally associated with manual fault insertion because it inserts the faults electronically. Training equipment last longer and troubleshooting is safer for both the student and the teacher. Troubleshooting is one of the most important skills a student can learn. To do so requires intensive practice in a realistic setting and teacher analysis of each student’s methods. The 890-FTS-1 module gives teachers the ability to accomplish this in an effective manner because it can automatically insert a wide array of faults throughout the training system and record student responses in a computer database. With this system, the teacher can work freely in the classroom, analyzing each student’s results and coaching them while other students are performing their troubleshooting exercises. 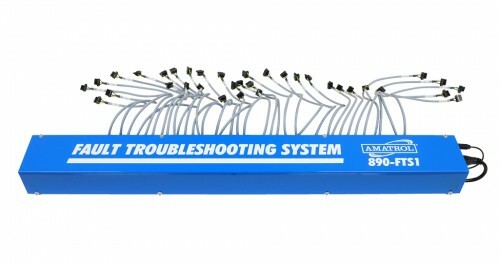 The 890-FTS-1 Motor Control Troubleshooting Module consists of FaultPro software, PC-based fault control card, fault module with a wide array of faults and individual plug-in connection cables, power supplies, and operation manual. FaultPro software is a Windows-based software package that provides an online interface for student troubleshooting and a database for recordkeeping of student responses. The 890-FTS-1 can insert faults into electrical lines that carry full power to electric motors as well as control level signals, providing students with a more realistic troubleshooting experience. It contains heavy-duty industrial relays that are optically-isolated from the PC running the Fault-Pro software. The 890-FTS-1 easily mounts to the rear frame of the 85-MT5 Motor Control Module and connects to the 85-MT5 components. A USB cable provides communication between the PC and the Fault Control Module. screens, making it easy for students to perform their own troubleshooting exercises. Students get immediate feedback about their responses so they know if they are learning. An online help screen provides step-by-step instructions during the troubleshooting process. a rubric, which can be edited by the teacher. The data recorded includes: which faults are mastered, total time spent on each fault, and number of tries to master each fault. Class statistics can also be generated so teachers can analyze exercises and students. FaultPro software gives the teacher the ability to create custom templates for each troubleshooting exercise so students are presented with an appropriate troubleshooting experience for each lab activity. Faults can be added or deleted to each exercise as needed. Templates can be created for entire classes so setup for new classes is only a few clicks away.